This is my wonderful Dad, Derek, who is a Solutions Director for a company called Crimsonwing and the reason that I have turned out with quite such geekish tendencies. An avid bridge fanatic, photographer, general knowledge whiz (don’t even try and beat him at scrabble or trivial pursuit) and lover of all gadgetry. He’s also doing an MA in Philosophy (clearly having the kids out of the nest has left him with far too much free time) which you can read all about on his blog at www.A85X.com. I think we are banning him from doing a PhD so that we don’t end up with Dr. Derek in the house! And this is my lovely Mum, Yeside, English teacher of countless generations of Surrey and Hampshire kids (which is a little like living with a local celebrity). She maybe short, but the best things come in small packages. Recently quoted as saying she hasn’t decided what to do when she grows up yet, Mum is currently being a fiend on the tennis courts, playing the saxophone, learning spanish and has just taken up ice skating! 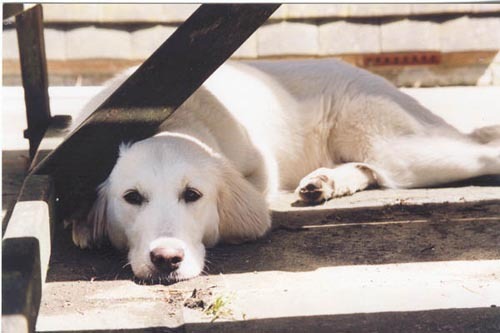 And finally the youngest member and also the hairiest, Sophie, our lovely if slightly crazed Golden Retriever. Not that she ever retrieves anything of course – throw a ball for Sophie and she’ll look at you as if you’ve lost your mind before trotting off to do something else. She’s unbelievably cute and boy does she know it but nobody else welcomes you back home quite like Sophie!